Katie wants a bike for Christmas. Of course not just any bike, but she picked out a couple of specific ones. One of them is too expensive and the other is expensive enough to make it a combined Christmas and birthday present, seeing as how they are in such close proximity to each other. Bikes are expensive these days! I asked her, you couldn't find anything at the bike shops you visited? She said everything cost too much and the ones that didn't cost too much weren't very good compared to the ones you can get from the online stores. It was nice, simple and sturdy. Just one speed and the brakes were the type that were applied by backpedaling, rather than by hand. I started out with training wheels, graduated from those and rode farther and farther from the house. That bike was the best thing I could have gotten. 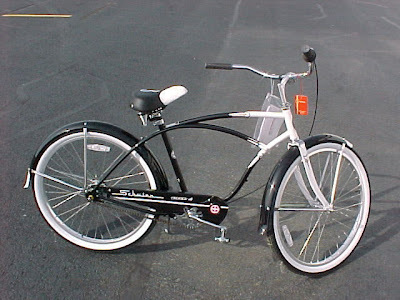 Then Schwinn came out with a stroke of genius: The Stingray model. Suddenly this became the rage. Everyone had one of these. Except me, that is. No matter how much I begged and pleaded, my parents would not get me one. My bike was good enough, they said. I used to wish my bike would break down so I could get a new one, i.e., a Stingray, but no dice. Mine was far too well-built to break unless it was a victim of sabotage and even then you'd have to run over it with a truck to disable it. Finally we worked out a compromise. 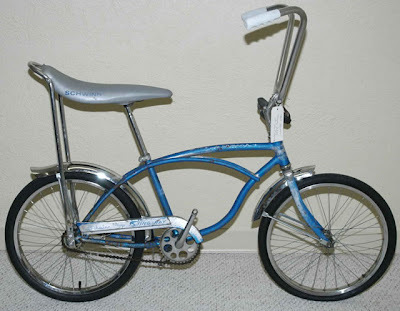 I got a set of butterfly (gooseneck) handlebars and a tuck-and-roll seat, just like the Stingray except I was riding around on a 24" frame whereas the Stingray was a 20" frame. It might have looked weird but it was actually a more comfortable and safer ride. 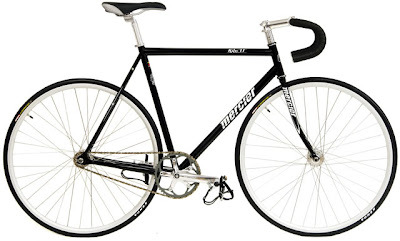 I made such good use of that bike - all the way through high school, although once I began driving I rode much less. But it was always there, always trustworthy. Through all the miles, nothing ever broke - it was amazingly resilient. I don't even remember what happened to it. I think my dad gave it away. Since high school I've ridden a bike maybe two times, three at the most. Riding one was so much fun. Julie doesn't want me to ride one because she thinks I'll get run since we live in the SGV, heart of the worst drivers in the world, haha. Yup, it was a lot of fun, as well as great transportation in the absence of a car. I still dream of riding that very bike in the old 'hood, too. I loved it. Too bad I don't have it anymore. Those were the days..